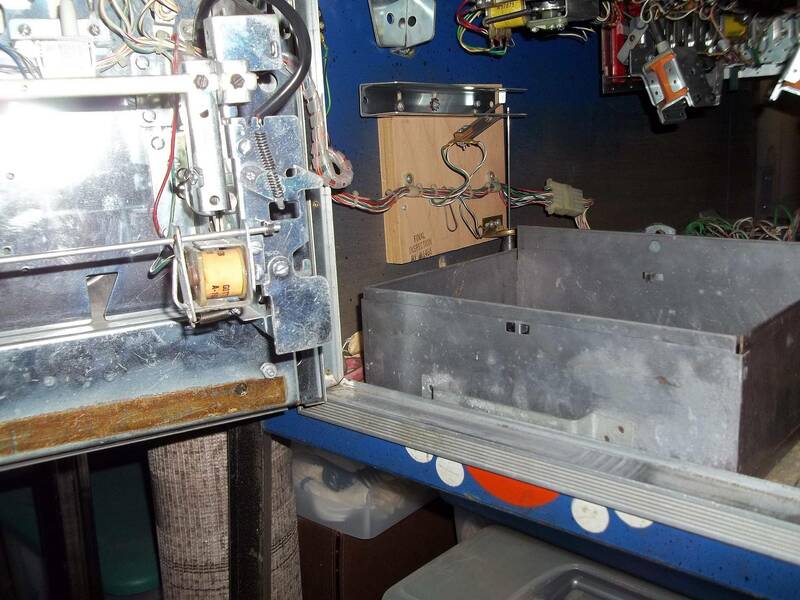 » Forum » Tech » Tech: Early solid state » Gottlieb coinbox doesn't fit in an Gottlieb machine. Huh? 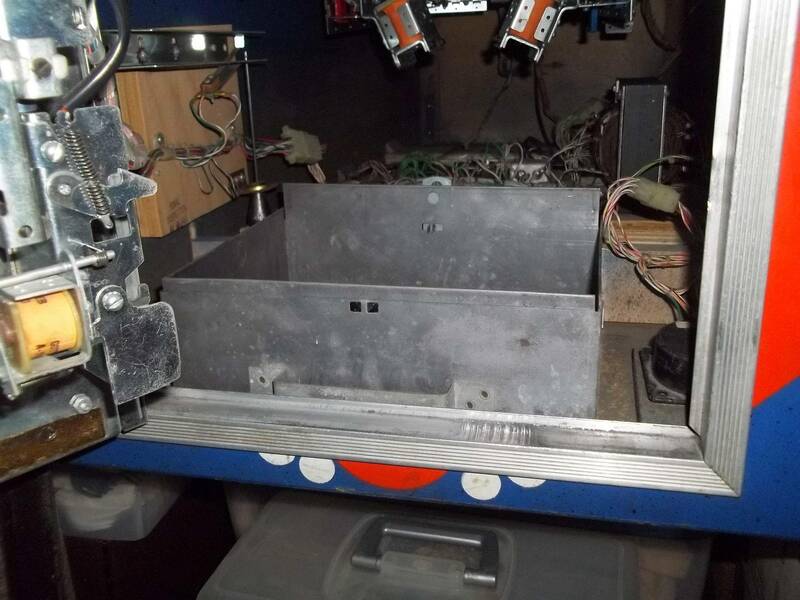 » Gottlieb coinbox doesn't fit in an Gottlieb machine. Huh? Gottlieb coinbox doesn't fit in an Gottlieb machine. Huh? I have a 1978 Gottlieb Sinbad, and I just bought what I thought was a coin box from the same era. The box fits in the cabinet, but unfortunately, because of the way the handle sticks out on the front, the coin door will not close. 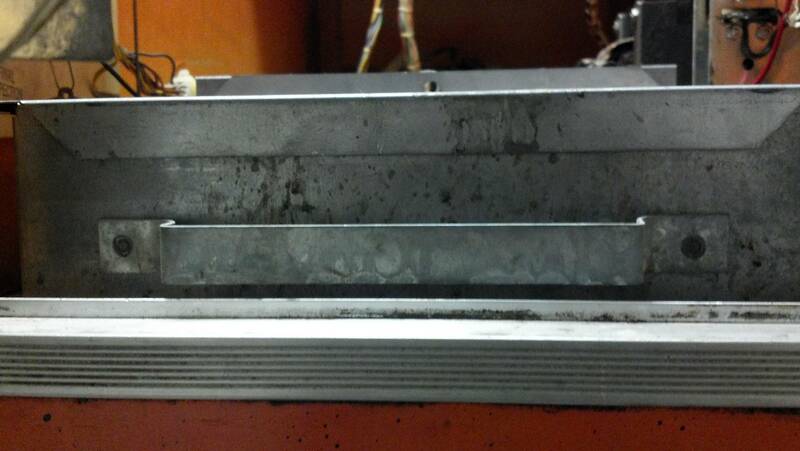 The back of the coin door's return slot bumps against the coin box handle. 1) It's simply the wrong type of coin box. 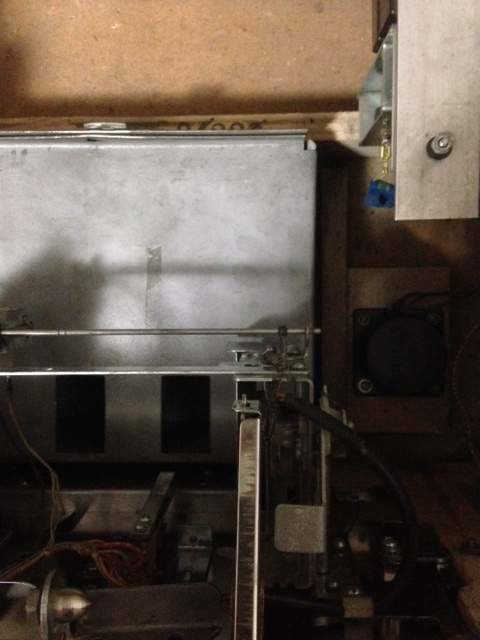 2) The cabinet's bottom may have been replaced at some point, and the brace across the cabinet that the coin box sits in front of might have been moved. 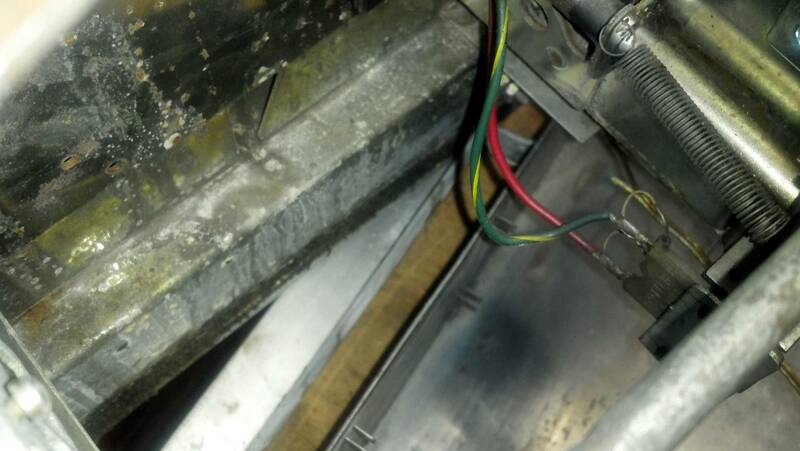 3) It's the wrong coin door, or an incorrect part on the coin door. The coin box measures 11" wide. It measures 8-1/4" without the handle, and 9" with the handle. It's 3-1/4" high. 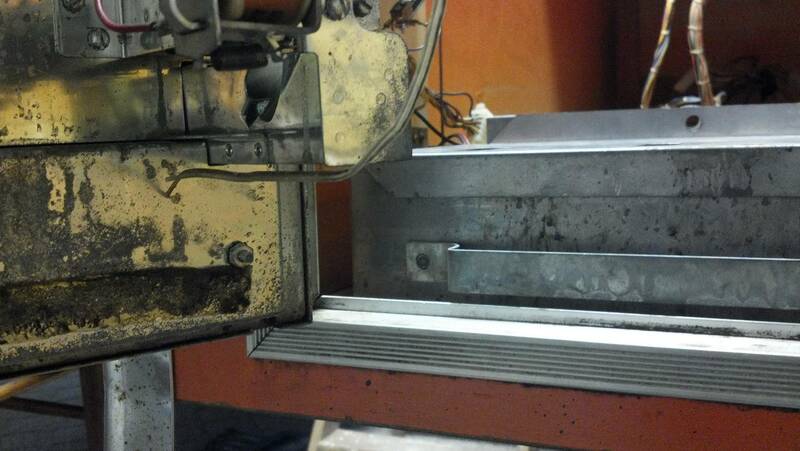 The distance between the cabinet brace and the inside face of the cabinet is 9-1/4". Does anyone know what might be wrong here? It looks like the handle was added later. You could use the box in a different machine.<<<<<<<<<< Bad advice^^^^^^^^^^^ ............. Better advice to follow. Looks like it's from an older EM. 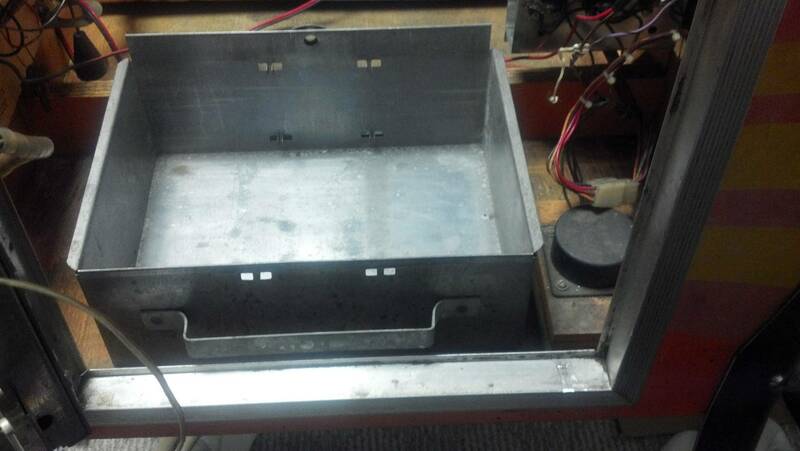 If this is the wrong box, what might be the correct coin box for an early solid state machine? I have measured the 3 EM Gottliebs I have and the distance from the metal locking bar on the wood cross member to the inside of the coin door opening is 9 5/8th inches. The handle is exactly like my coin box. The box should drop right in an EM Gottlieb. 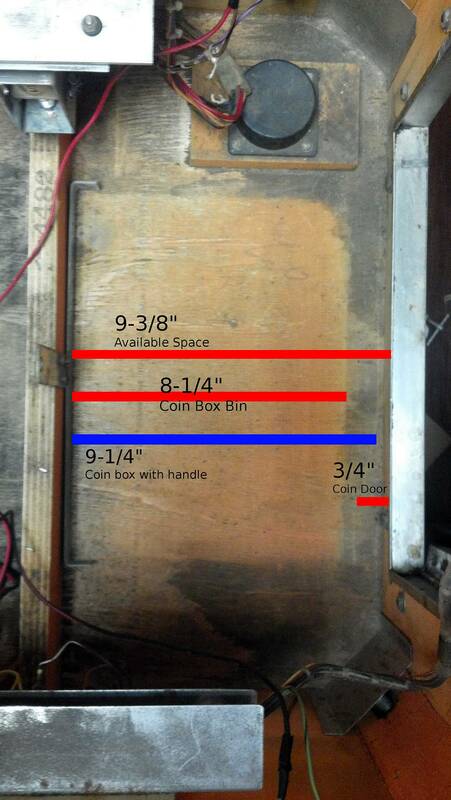 Measure your coin box area. Those early SS pins are similar in some ways to EM pins. This coin area must be different. The height of the coin box you have may be to tall for the coin door on the SS pin. Those early SS pins are similar in some ways to EM pins. This coin area must be different. 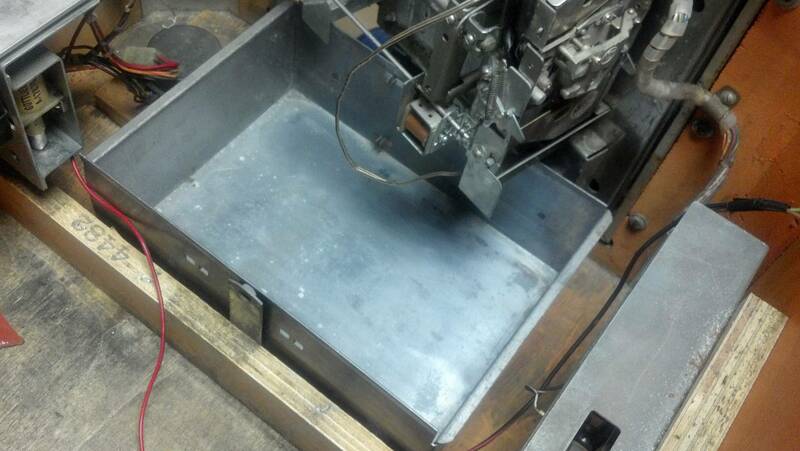 Ok, removed the coin box and re-measured to match what you were measuring to get a more accurate measurement. 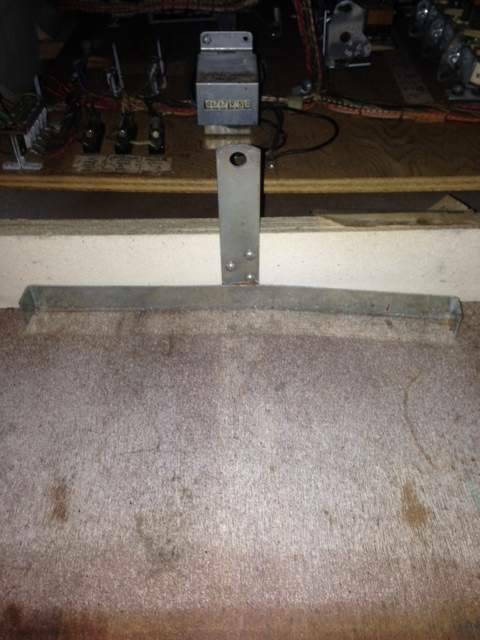 From the locking bar to the lip of the coin door is 9-3/8"
There seems to be a 1/4" difference between the machines you measured and the one I have. It doesn't appear as though the wooden brace across the cabinet has been moved. There's a deep notch in the cabinet sides where it is inserted. 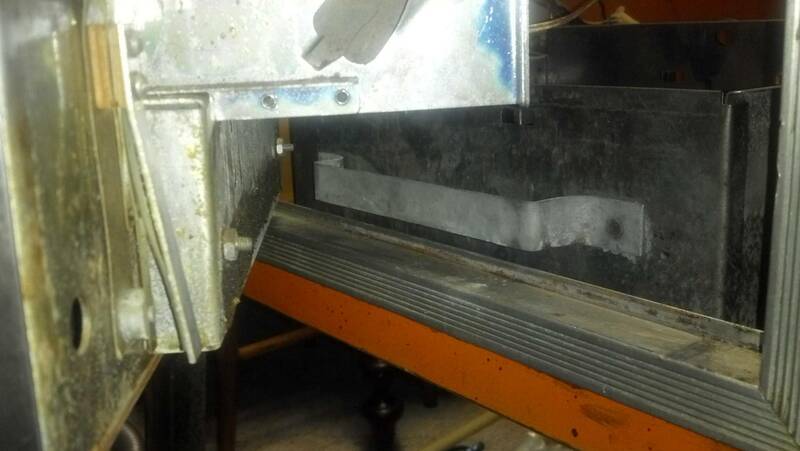 The back of the coin door's coin return plate sticks 3/4" into the cabinet. The grime at the bottom of the cabinet leaves a shadow that is 8-1/4" deep, which is the same depth as the coin box I just acquired. Here is the other factor. The size of the coin door. Later EM pins have the larger coin door. So does the early SS games. 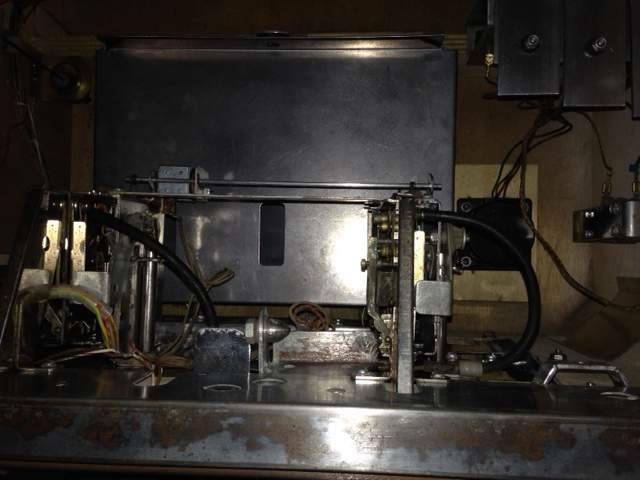 The coin box for the 1975 Abra ca Dabra ,will not work in the 1976 Solar City. The early EM coin box has a height of 4 inches. The coin mech parts hit the coin box. A shorter (lower) box will be needed for the larger door pins. My coin box measures the same. Here it is in a CountDown. It sits in there slightly offset to the left. The pics show the door just clearing the Box. It does shut easily all the way. By comparing the photos. Pdman's coin box sits lower in the cabinet, look were the handle is positioned. Is the handle attached lower on the coin box, for the larger coin door. On my machine, the strip of padding makes contact with the handle. And the bottom of the handle is just about level with the lip of the frame of the coin door. It looks like the handle on your coin box might be sitting lower on the box. On my box, the bottom of the handle is 1-5/8" from the bottom of the bin, and the handle itself is 3/4" high. That's your issue, the handle. My handle bottom is ~ 3/4" above the box bottom. Top of the handle is 1 9/16". So you need to move the handle down so the box will fit in the Sinbad. My Handle looks like a couple of spot welds on each side. Now that I see comparison photos, yep, it sure looks like that's the problem. These handles have some sort of rivets. I'd rather not modify it and leave holes in the box. I'm hoping I might be able to find a box on ebay or some other place that has parts available. Just drill out the rivets. The left over holes will be negligible. Then drill new holes for the handle and pop rivet it on or use machine screws, washers and nuts. As Lloyd said, you have an earlier EM coin box in your game instead of one made to fit the larger coin door. The handle is too high on ones that go in earlier EM's. The sliding lid is also another give away. The later coin door had a lid that sit inside of the box instead of sliding on, just like the Countdown box in the above pics. 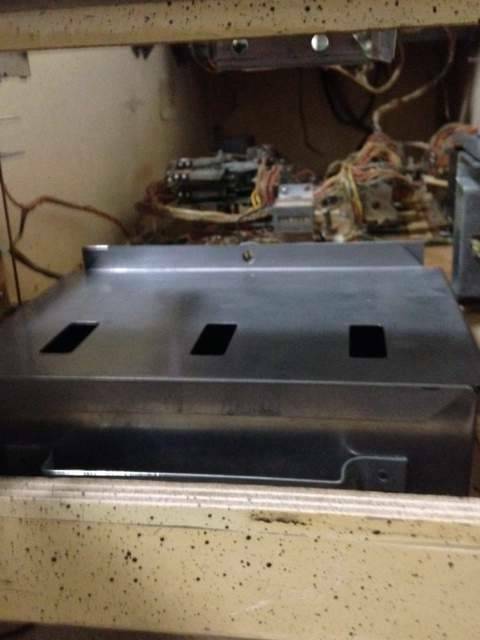 I am currently restoring operation of the coin mechanisms in each of my machines and also want to obtain coin boxes to suit. I have the opposite problem of ForceFlow. I am ok with the later large door coin boxes but am anxious to see an image/dimensions of those for earlier 70s models ie Abra Ca Dabra, El Dorado, Atlantis & High Hand. I would really appreciate if someone could post the image/dims pls. There's been two different kinds I've seen so far. The ones for EM machines have a handle with a single rivet on each side, the handle is placed higher, and the cover slides off. 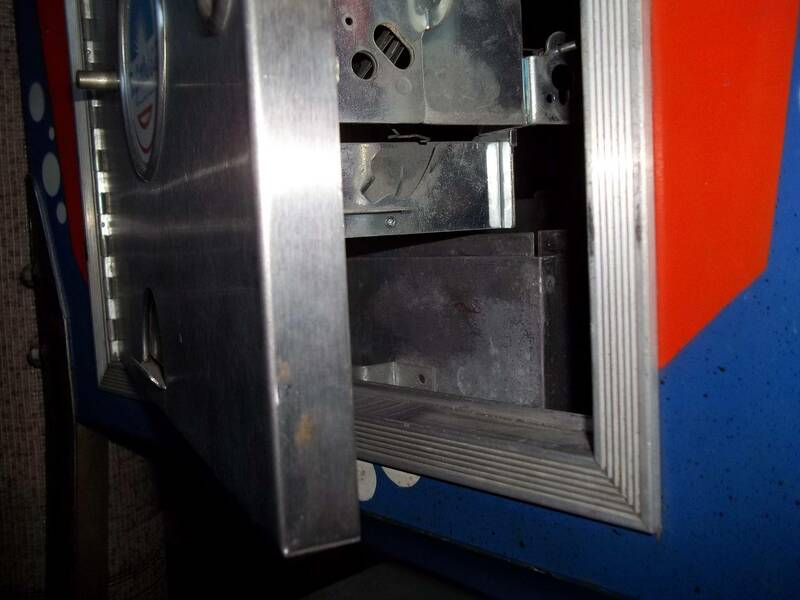 The ones for SS machines have a handle with two rivets on each side, the handle is placed lower, and the cover lifts up. The bins themselves have the same dimensions--it's only the height of the handle that seems to vary. I think I saw one or two pop up on ebay recently. So I assume there is a specific different product but does not appear to be listed in the Gottlieb 1978 parts catalogue. Huh...interesting. Maybe the one you have is a pre-1970s model? Multiple models certainly makes things difficult. Especially since I haven't seen any good documentation on coin boxes anywhere. Might be helpful to start documenting these on pinwiki or something. That coinbox is from a 1975 large door Sure Shot. Perhaps Dirt Flipper may be able to come in on this one. He has a tremendous knowledge & memory for all things Gottlieb. This link appears to be the coin box of the 70s era to suit the earlier(smaller) metal door. Note the location of the right lid slot which seems to resolve my issue with the later coin box. Well I finally acquired a cash box which fits my 70s Gottlieb EMs prior to the recessed door era. 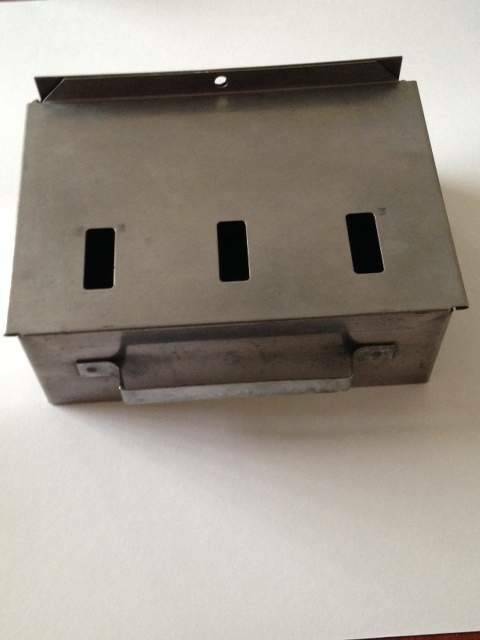 This cash box fits the opening; aligns with the rear locking bracket hole, and the coin chutes. 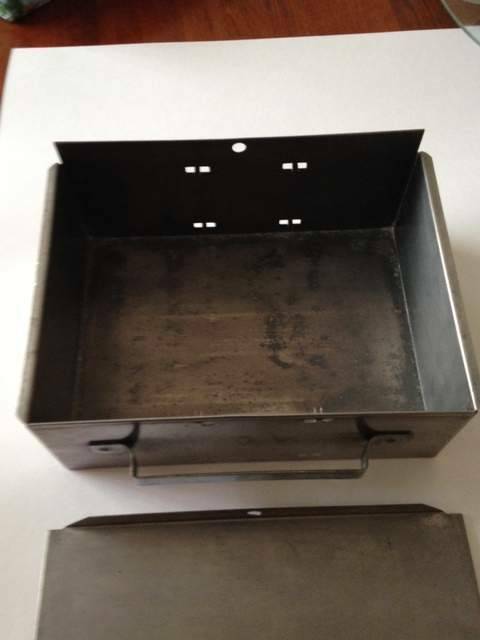 In reference to earlier posts the dimensions are box 11"w; lid 11 1/2" W; box & lid 8 1/4"D; box 4"H and rear of lid tab 4 3/4"H. The cash box which is stainless steel (this is the first S/S I have seen) has internal pressed lugs which I assume accommodate x3 plastic trays. I do not have those trays and not seen them for sale. I think the double pressed tabs were designed to hold a flat sheet of plastic as a divider instead of the full plastic trays like Bally and Williams used. Thanks for posting the actual dimensions. It will probably help someone (like me) when searching for the correct one in the future. Thks for the divider clarification CactusJack over which I had no understanding. What is your take on the stainless steel mfg which I had not seen before. I have never seen a SS cash box to my recollection. At least, I never paid that close attention back in the day. And, just about anything I have today is either powdered with white corrosion or that beautiful orange rust. Speaking or orange rust!! I only just noticed in my last pic what has developed on the locking bar in a week. It was pristine including rust removal just that long ago. Living near the ocean has drawbacks!!! If you can't get one dasvis pretty easy to fabricate. It also has a cross brace which precisely locates the cash box but I have noticed that many, if not most, of those cross braces are missing. I am about to 'make' a few!! Guess I don't get out much.... never seen one of those..
Those cross braces appear to have been used on later large door games where there were no locating timbers for the cash box in the cab bottom. This appears to be another variation on what I understood to be cash box design. 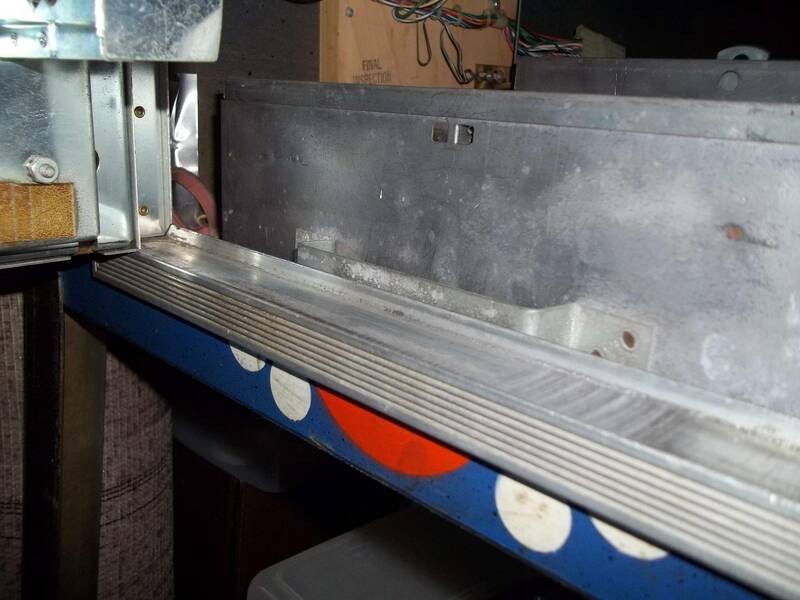 In this ebay listing at pic 11 the cash box lid does not slide but is located in the cash box by bent tabs although the cash box has slide provision. I have not previously seen this type of lid. It looks to me like a late Gottlieb lid in an early Gottlieb box. 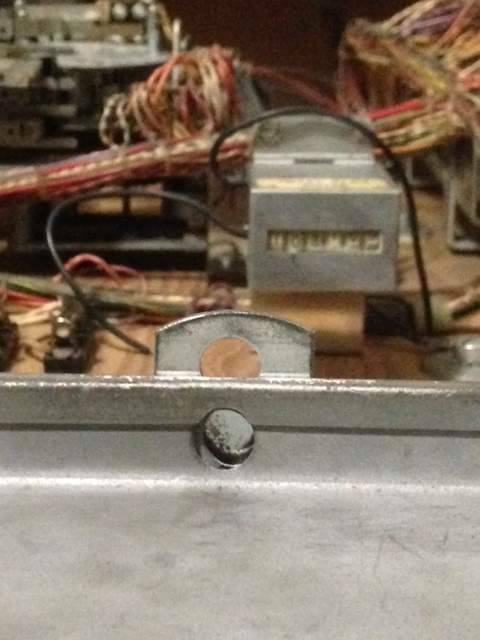 The handle is too high for Gottlieb's (late EM through System 80A) with the larger door and frames. 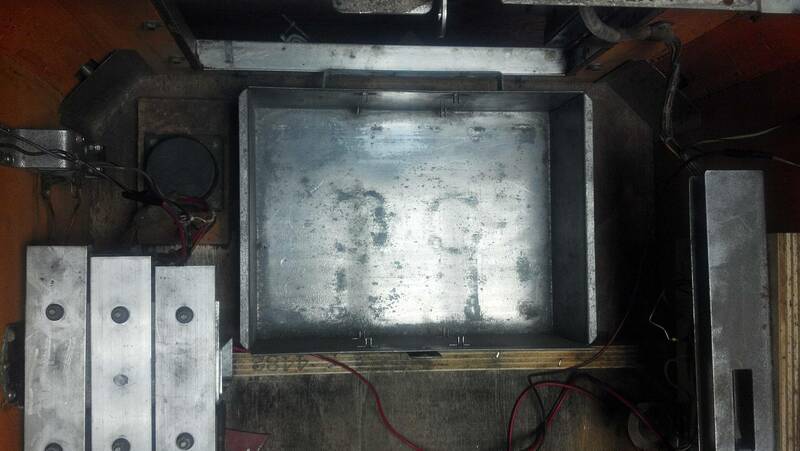 Yep, looks like it is an EM box with an SS cover--The box is designed for covers that slide in, the cover is designed for boxes where the cover drops in.